The 2010 Gustavus women’s soccer team will look for a turn-around season in a new decade and improve on its 7-8-3 record (3-7-1 MIAC) and ninth place conference finish of last season. Head coach Mike Stehlik, in his 20th season as the head coach of the Gustavus women’s soccer team, will command another young, but talented, squad. The Gustavus women's cross country has been recognized by the U.S. Track and Field and Cross Country Coaches Association (USTFCCCA) as one of the top teams in the Central Region to start the 2010 season. The Gusties are ranked sixth in the first regional poll of 2010. 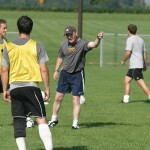 The Gustavus men's soccer team reported to campus on Sunday, August 22 to begin preparations for the 2010 season. Head Coach Mike Middleton begins his first season leading the men's squad after replacing long-time coach Larry Zelenz. The Gusties open regular season play on Saturday, September 4 with a contest against Northland College in Duluth, Minn. The Gustavus volleyball team arrived to campus on Saturday, August 21 to kick off preseason workouts for the 2010 season. The Gusties are under new leadership as Rachelle Dosch begins her first season as head coach. Dosch welcomed 15 players to preseason training. The Gusties first match is in Elmhurst, Illinois on Friday, September 3 as they will participate in the Elmhurst Invitational. 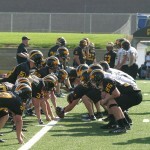 The Gustavus Football Team opened its 2010 preseason camp Sunday, August 22. A total of 110 players reported to St. Peter eager to begin a new season wearing the black and gold. The Gusties look to an experienced defense and a balanced offensive attack to bring success in 2010, which will open on September 11 against Wartburg College at Lloyd Hollingsworth Field. 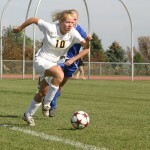 The Gustavus women's soccer team opened the 2010 season with its first practice on Thursday, August 19. Head Coach Mike Stehlik welcomed 32 players to campus on Wednesday to begin preparations for the 2010 campaign. The Gusties open regular season play with a contest at the University of Wisconsin, Stevens Point on Wednesday, September 1 at 2:00 p.m. The Intercollegiate Tennis Association (ITA) released its 2010 All-Academic Teams and Scholar-Athlete award-winners recently and the Gustavus women's tennis team was recognized for its outstanding academic achievement.